In addition to the quality of product data, quick and easy onboarding is just as much of a success factor for your platform. At the same time, managing numerous data feeds presents a considerable challenge. With the Data Connector, you can implement simple and comfortable onboarding of external product ranges onto your platform while retaining an overview of all incoming data feeds. The providers’ data feeds are structured here in a unified, standardized, and validated way. Successful listing of external product data. Onboarding begins with importing and harmonizing the product data to your individual target data structure. The Data Connector works independently of any system and allows you to import product data in various formats and coding. The integration is carried out automatically and thereby reduces the time-to-market. Structured data are the basis for your platform’s granular search and filter functions. With the Data Connector, you can categorize and standardize your product range in a unified way and thereby create structure and comparability. Through predefined functions and templates, you can use bulk processing to adapt and optimize thousands of data sets. Enforce data governance guidelines and increase product data quality. As a central monitoring body, the Data Connector offers extensive validation options. This way, you can ensure that no products reach your platform which do not meet your feed specifications. Comprehensive quality reports provide information on necessary optimizations. The transmission of your platform’s product data feed will take place according to your individual specifications. You individually define the update frequency for each data feed. Import your suppliers’ data feeds and map these to your target data structure. Ensure retrievability with a uniform categorization. Create comparability by standardizing attributes and uniform data standards. With predefined functions & templates, you can comfortably optimize thousands of data sets for your platform. Improve your platform’s user experience by enriching product data through external data sources. Comprehensive validation options secure the product data quality on your platform. The data transmission is carried out via an individually defined interface to your platform. Individually define update cycles for every data feed. 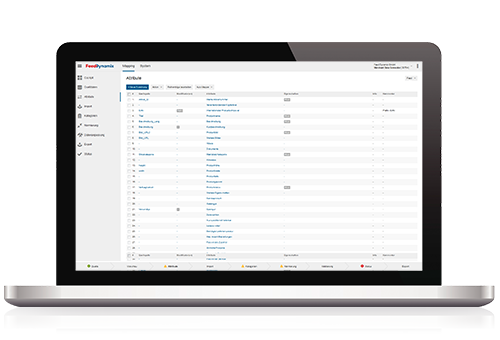 Granular reports allow you to monitor supplier performance and product data quality. Specific roles & permissions make self-service use of the Data Connector possible for those working on the platform. White labelling allows for seamless integration into your platform world. Fast and easy product data integration with the Data Connector. Learn how the Austrian marketplace, shöpping.at, integrates and optimizes product data with Feed Dynamix.